In the shoe and boot world, leather and hard rubber soles are commonplace, but a softer, less common variant appears from time to time—Crepe Rubber. This crinkly, cushioning material is famous for appearing on the sole of the iconic Clarks Desert Boot, and many brands still use it today for a softer sole. Crepe, or Plantation Rubber, is a natural material that’s predominantly made from latex tapped from trees like the Pará rubber tree. After being harvested in liquid form from the tree, the raw latex is then coagulated to form a semi-solid substance, and then crushed, pressed, and rolled into sheets using a series of machines. Now a solid material, the sheets of Crepe Rubber are then sent to manufacturers to be cut into soles for shoes and boots. Crepe Rubber is often sweet-smelling and crinkly in appearance, but textures and composition can vary from sole to sole. Some Crepe Rubbers can be stiff and almost as hard as leather sole upon purchase—requiring some breaking in—while others will be softer and provide more traction form the get-go. Affordability — Crepe rubber has a relatively low production cost, which in turn can lower the cost of products that use the material. Comfort — As it softens more and more with each wear, the material provides excellent traction and cushioning for your feet. Some hail Crepe soles as the most comfortable, and brands often add a crepe sole their mainstay models for a more comfortable option. Sustainability — Tapping rubber does not harm trees. In fact, a single tree can be tapped regularly for up to 40 years, and produce up to 19 pounds of latex rubber every year. Cleaning — Crepe rubber soles can become dirty very easily due to their abrasive nature, and once they’ve been marked, it can be extremely difficult to restore the rubber back to its original color. You may be able to remove some surface marks, but the sticky Crepe retains dirt, making discoloration nearly impossible to reverse. 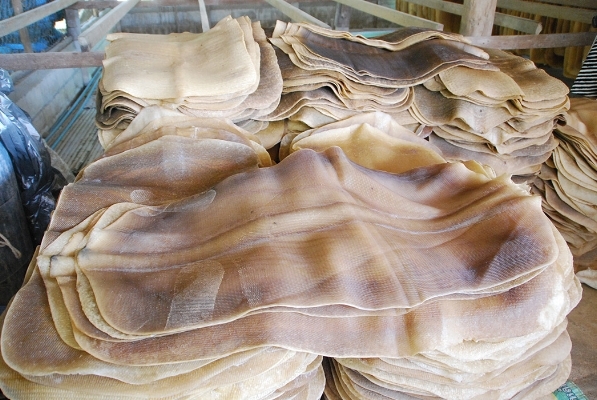 Resoling — Many Crepe Soles are not replaceable, or indeed repairable. Durability — Crepe rubber will eventually break down if frequently worn on hard, rough surfaces like concrete. The longevity of the sole will depend on how thick it has been cut, however.